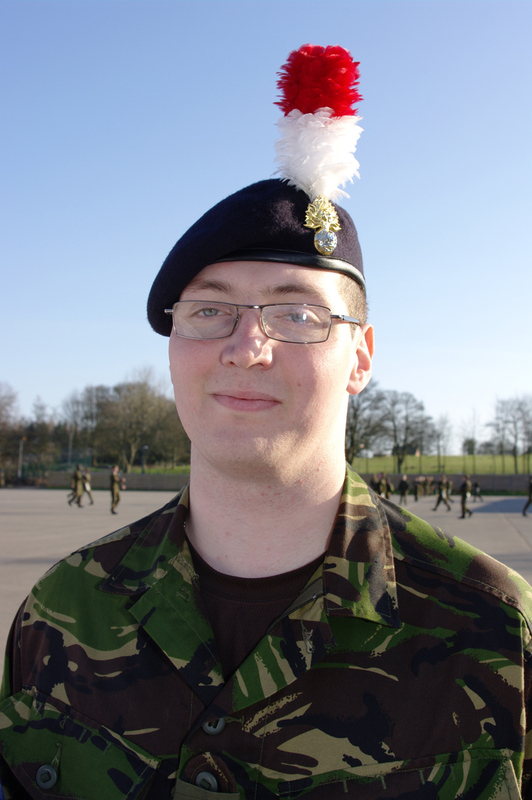 Fusilier Johns is back at the Infantry Training Centre, Catterick, after 2 weeks of leave. Training is underway again, this week with driving theory tests and live firing on the light machine gun. Week 14 was the first one back after 2 weeks of leave. It was good to get a break, but people were glad to get back to crack on with training. This week was driver theory training week. The guys who don’t have a driving licence went away and started learning to do the theory for the Cat B. As I and several others already had Cat B we started to practise for our Cat C theory. If we pass this then we have the chance to take the practical test at the end of training, depending on the amount of spaces on the course and what our battalions want us to do. Quite a few of us passed the theory before Thursday so we spent the rest of the week doing administration. We cleaned and checked our weapons for faults and then we had the opportunity to work on our best books so they were up to a high standard. (These are where we keep all the notes we have taken over the course). It is useful as we have so much information thrown at us in a short space of time we use this to keep our knowledge and hold it for future reference. Friday was live firing on the light machine gun (LMG). This was out to 100m and it was to get us ready ahead of LMG camp next week. I really enjoyed firing the LMG and am looking forward to the camp. We will be spending the whole week live firing and it should be really enjoyable. Here’s another update from Fusilier Stephen Johns at the Infantry Training Centre, Catterick. He recalls week 12 of phase 1 training and a further step towards passing out. Week 12 for me started with the phase 1 output test. This is a 6-mile loaded march carrying 20kg followed by RMT (Representative Military Tasks). I didn’t take part in this as I was still injured at the time – so I am doing it at the end of next week. Thanks to all the effort everyone has put in and the efforts of the PTIs and platoon staff over last few weeks everyone passed so we only have the ACMT and Tactical Exercise 1 to pass to complete phase 1. The rest of the week has mainly been spent at the ranges doing practise shoots for the Annual Combat Marksmanship Test which was run on Thursday. Again, thanks to the platoon staff and their high standard of teaching, everyone passed despite being nervous on the day. On Friday we went back to the ranges to practise the shoots that the platoon had scored the least on. We also did our weapon handling test for the light machine gun and I was one of the people that passed first time. Next week we have Tactical Exercise 1 to look forward to, which is a 3 day 2 night exercise. We had lunch at the top! In his latest blog, Fusilier Stephen Johns, a soldier under training at the Infantry Training Centre, Catterick, reports on a packed week of adventurous training. This week we had adventurous training. We got to Halton on Monday with the other platoons and we were split down into groups of 8-12 people. We then had a brief about meal times, the accommodation and safety in the lines for the week’s activities which began the next day. We were in the caves until about 1500hrs, then started our return to camp. We had quite a lot of downtime to ourselves to relax. On Tuesday we did rock climbing and abseiling. Some groups did this indoors because of the weather but we were outside. We drove to an abandoned quarry where we did our abseiling. It was about an 80 foot drop, which was great fun and most people enjoyed it apart from people scared of heights! Wednesday was kayaking and canoeing. This was great fun and one of the most enjoyable events. Once we were taught the basic techniques and had a bit of practise we had a game of water polo, which was a good laugh. On Friday we did mountaineering. Everyone was given a map and compass and we went to the top in a group. We had lunch at the top! On the way back down everyone took it in turns to navigate to a certain point. The aim was to improve our practical map reading skills. Overall the week was an enjoyable one. We stopped off in a different village each day, everything we did was based around improving skills we had learnt in the classroom and also focused on the Army’s values and standards. We couldn’t see out to 100m! Fusilier Stephen Johns writes once again from the Infantry Training Centre, Catterick about his latest experiences of Army basic training. It’s been a busy week – even with a foot injury! Personally I didn’t do much this week. I injured my foot at home so have been going to the Medical and Physiotherapy centres. I’m trying to get fit again for week 12 when we have our 6 mile output test. I’m confident that I will be back by then although it may mean missing a good week of adventurous training next week. My platoon this week started with another 5-mile loaded march. This was the second one at this distance and so people were more used to it and nobody struggled too much this time around. This puts the platoon in good standing for the output test on week 12. We’ve had a lot of lessons this week, focusing on Battlefield Casualty Drills (BCD), map reading and the light machine gun (LMG). The lessons have been going well. Our platoon staff have been teaching us well and the we are picking up the content quickly. Our map reading lessons are getting more advanced. We all passed our written progress test and have a practical map reading exercise next week during adventurous training. We have also had a written BCD test, which we haven’t had the results for but I am confident we have passed. At ITC Catterick the training staff are good, as they go through everything you need to know and they make sure everyone understands. They don’t shout and bawl at you if you don’t pick things up first time. They want you to learn and understand what is being taught. We have also been on the ranges and also the DCCT. We are shooting out to 300m again, practising for the marksmanship test. On the range the weather was foggy so everyone had to wait a couple of hours for the shoot as we couldn’t see out to 100m! This week was not as good as last week for shooting and not everyone passed. There were quite a few reshoots. Even on the DCCT we had people failing as the standards needed to pass have increased. We will definitely need the few days on the ranges in week 12 before our marksmanship test. Writing from the Infantry Training Centre, Catterick, Fusilier Stephen Johns details his 9th week of Phase 1 Training – a week in which he’s marched further, heavier and faster than before! A few people came back from weekends at home and were a bit down. Some wanted to quit. But after a bit of talking about it they decided not to and to keep going with training. We’re now at the stage where we’re all mates and we can pick each other up when we’re down. We had a 5-mile loaded march this week. It was the furthest we’ve marched, carrying the most weight and at the quickest pace so far. I struggled, as did a few other people but apart from one person who had an injury everyone finished. We continued to learn about the light machine gun this week, and we are getting quicker and slicker at the drills. I am looking forward to the first time we fire it which is coming up in a few weeks. I will let you know how it goes. We are also continuing to learn about map reading and battlefield casualty drills. The whole platoon is picking these up quickly and we are getting in front of the lesson plan! Plus there was a day on the ranges. We were lucky as it was one the best days for shooting. It was a nice, warm and sunny day with hardly any wind. We are practising for our Annual Combat Marksmanship Test (ACMT) which is due in week 12. I am doing OK at shooting and I didn’t have to do any reshoots at the range. We have one person in the platoon who only dropped one shot. We have more shooting practise before the test – a day next week and then a further 2 in week 12. Next week we have another 5-mile loaded march, the steeplechase and another range day to look forward to. Fusilier Stephen Johns writes once more from the Infantry Training Centre, Catterick. Week 8 for me here at the Infantry Training Centre, Catterick, started with a 4-mile loaded march. This was further and with more weight than before. It was difficult and some people struggled as they had been home over the weekend (and probably partied a bit too hard) but everyone finished. We also had an overnight field test, examining at all the things we had learned over the first 3 exercises. It was a cold night but luckily it didn’t rain. We also went to the indoor training range to learn to shoot out to 300m. At first it was quite difficult as it was the furthest we have shot to but after bit of practise we all improved and everyone passed. We finished the week with a log race which my section won. We carried the log over about 3 miles. We had more Light Machine Gun lessons and a few lectures on the law of armed conflict and rules of engagement – everyone needs to learn these. Fusilier Stephen Johns writes from the Infantry Training Centre, Catterick, with an update on his most recent week of training on the Combat Infantrymans’ Course. Week 7 of the Combat Infantrymans’ Course began with work on the ranges – firing from a distance of 100 metres. This is more difficult than shooting at 25 or 50 metres but it was enjoyable and a good experience. On Tuesday we had a swimming test. We had to swim in uniform around the swimming pool after treading water for 2 minutes. It was more difficult than swimming in shorts but most people still managed to pass. After swimming we had bayonet fighting. The corporals motivated us from the start to try to get maximum aggression out of us. It was difficult – but also enjoyable. On Wednesday we had introduction to the steeplechase. It had been raining the night before and the course was muddy which made it difficult going, even though it was just an introduction! For Thursday we were back to the ranges, having our rifles zeroed to our eyes. It was a windy day which made it a little more difficult. Then on Friday we had circuit training which was more intense than our last lesson. But the physical training here is progressive and it gets a bit harder every week. We also went on the Dismounted Close Combat Trainer (DCCT – an indoor laser range). We were simulating shooting at 100, 200 and 300 metres. And everyone passed!